The sanctuary was created 250 years ago and is named after a Keoladeo (Shiva) temple within its boundaries. Initially, it was a natural depression; and was flooded after the Ajan Bund was constructed by Maharaja Suraj Mal, the then ruler of the princely state of Bharatpur, between 1726 to 1763. The bund was created at the confluence of two rivers, the Gambhir and Banganga. The park was a hunting ground for the maharajas of Bharatpur, a tradition dating back to 1850, and duck shoots were organised yearly in honor of the British viceroys. In one shoot alone in 1938, over 4,273 birds such as mallards and teals were killed by Lord Linlithgow, the then Governor-General of India. After India's independence, the rulers of the princely states were allowed shooting rights until 1972. In 1982, grazing was banned in the park, leading to violent clashes between the local farmer and Gujjar communities. Bharatpur was founded by Maharaja Suraj Mal in 1733 AD when it was carved out of a region named Mewar. Some say that the foundation of Bharatpur wad laid by a Jat chief Rustam and it was Suraj Mahal who captured the fort of Bharatpur from Rustam's son and later built on the city in due course of time. From 17th century onwards, Bharatpur was dominated by Jats. Maharaja Suraj Mahal, himself being a Jat played an important role in unifying all the Jats of the region. It was under his aegis that a number of places and forts sprung up in Bharatpur including the magnificent Deeg Palace. Underrated by most visitors to Bharatpur who head for its National Park and Bird Sanctuary, the fort held by the Jat rulers of this state has bastions of sand that were strong enough to absorb the impact of canonshells that simply embedded themselves within it. Impregnable to most attacks, this 18th century fort was ordered by Maharaja Suraj Mal, the founder of the dynasty at Bharatpur. Lohagarh is located in the heart of the old city. And its entrance is from a crowded street that leads through the massive entrance gate into what is a living fort with several modern additions. However, the part of the fort that has been preserved consists of sprawling palace complex since it combines Rajput and Mughal architecture with Jat influences in building style, a few of eight original towers of which Jawahar Burj and Fateh Burj are of particular interest, and floors laid with tiles. A few of the eight imposing towers still stand erect within the glorious ramparts of the Fort. Especially two of them - Jawahar Burj and Fateh Burj are of special interest. These were build by Maharaja Suraj Mal to commemorate his victories over the Mughals and British respectively. The coronation ceremony of the Jat rulers of Bharatpur was also held at the Jawahar Burj. This Royal edifice is a fusion of the Mughal and Rajput architectural styles with magnificent apartments and intricately designed floor tiles having interesting patterns. Once can marvel at the ancient exhibits displayed in the museum in the central part of the palace. Located in the center of the famous Lohagarh Fort, the Bharatpur Museum houses a rich collection of archaeological wealth of the nearby areas as well as from the old Bharatpur State. The huge palatial building Kachahari Kalan, once the administrative block of the rulers of Bharatpur State, was converted into a museum in 1944 AD later on, Kamra Khas (personal chamber) building on the first floor was added to the museum. It exhibits sculptures found during the excavation of old villages e.g. Noh, Mallah, Bareh, Bayana etc. ranging from the Kushan period (1st centaury AD) to 19th Century AD. Weapons used in battles in the medieval period by the Jat rulers, paintings, manuscripts, zoological specimens, local art and craft and carving on sandal wood and ivory etc. offer a glimpse into the Glory that was once Bharatpur. Located 34 kms from Bharatpur is the ancient town of Deeg. It finds mention in Skanda Purana as Dirgha or Dirghapura. The place is now known for its famous water palaces, gardens and fountains. The famous old fortress of Deeg, which contributed substantially in the making of the Jat Principality, is now in shambles. Its formidable cannons now lie abandoned in the forlorn for. Deeg was the first capital of the newly carved out Jat State, when Badan Singh was proclaimed its ruler in 1722. the royal palace, built by Badan Singh, on the southern side of the garden is now called as Purana Mahal or the old palace. Deeg, because of its strategic location and proximity to Mathura and Agra was vulnerable to repeated attacks by invaders. In 1730, the Crown Prince Surajmal is reported to have erected the strong fortress with towering walls, bastions, a deep moat & high ramparts about 20 feed wide, in the southern portion of the town. Although Surajmal shifted his capital to Bharatpur, his liking for Deeg did not diminish. He built elegant Bhawans clustered around a garden complex, with fountains in the front & enormous water bodies in the rear. The entire complex of palaces & gardens is a marvel of engineering skill. The elegance of design and perfection of workmanship of these palaces is not seen elsewhere in India. The palaces form a quadrangle, in the center of which is a garden, an oblong space of 145 meters by 107 meters, laid out with flower beds and fountains. To the east & west are large masonry tanks, with another garden on the other side of the western tank beyond the buildings, forming the quadrangle. Bayana is located in a small plan, between two hills ranges running more or less parallel to each other near the left bank of the Gambhiri River, in the district of Bharatpur, 36 kms. from Bharatpur. The ancient name of Bayana was Sripatha or Sriprashtha. It is a curious mixture of Hindu and Mohammedan relics. Ruled by stalwarts like Mohammad Ghori, Sikandar Lodhi and Humayun, Bayana held a special place in history. According to Abul Gazal 'this town is the burial place of many illustrious men'. It can be adjudged that various important battles where fought here. Ain-e-Akbari mentions that in former times Bayana was the capital of a province of which Agra was merely a dependant village. Nearest airport at Agra is only 65 km away. Bharatpur is on the Delhi to Mumbai broad-gauge line. Bharatpur is connected to the rest of India with good Bus service. Founded in 1488, Bikaner is a desert built on an elevation and surrounded by a long embattled wall pierced by five gates. A magnificient fort built betwen 1588 & 1593 by Raja Raj Singh dominates the city. Best season to visit is between October to March. Sheer beauty in the desert is the royal fortified city of Bikaner. 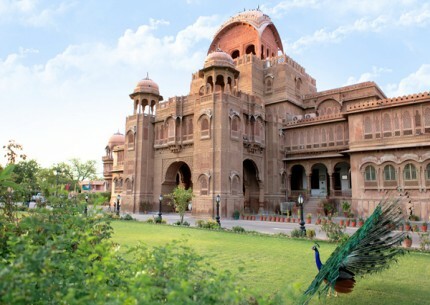 Lying at the northern tip of the famous triangle of the desert cities, Bikaner is a beautiful medival town. The genesis of Bikaner dates back to 1488, when a Rathore prince, Rao Bikaji, son of Rao Jodhaji of Jodhpur, chose a barren wilderness called ’Jangladesh’ and transformed it to a charming city called ’Bikaner’, after the founder’s name. Its location on the ancient caravan routes, which linked Central Asia and North India with the Gujarat seaports, made Bikaner a bustling trade centre in the times of yore. The history of Bikaner dates back to the late 15th century when enraged and provoked by his father, Rao Bikaji quit the palace in Marwar and established the kingdom of Bikaner in the midst of the desert surroundings. The prince fortified his kingdom in the year 1488. Since then, the city and the region has grown to be one of the reputed and richest kingdoms in the state of Rajasthan. It was the prophecy of Karni Mata who is believed to have foretold a lot about Bikaner. The Goddess prophesied the establishment of the kingdom founded by Rao Bikaji. The forthcoming kingdom was destined to be greater than that of his father Rao Jodhaji who was the founder of the kingdom of Jodhpur. Rao Bikaji, who was the descendant of the Rathore clan of the Rajputs, left his father's kingdom with a small contingent of 100 cavalrymen and 500 soldiers. The strategic location of the kingdom on the routes of the caravans brought great prosperity to the trading community of the kingdom. In the first few years of the kingdom, the Rajput king was in constant conflict with the powerful Bhati clan. The conflicts were resolved when Rao Bika married the daughter of the Bhati chief, Rao Shekha. The kingdom of Bikaner maintained cordial relations with the Mughals. In the 19th century, the kingdom provided Bikaner camels to the British army who got involved in the war with the Afghans. Bikaner was also the first kingdom in the desert state of Rajasthan to introduce electricity. The economy of the kingdom facilitated with the presence of the Ganga Canal that was established by Maharaja Ganga Singh. The camel corps of Bikaner are well reputed and participate in the Republic Day parade in the capital city, Delhi. Revel in the architectural splendour, as you take an intimate look at this imposing fort, built by Akbar’s contemporary Raja Rai Singh. Within the fort are thirty seven palaces and pavilions. Suraj Pol or the Sun Gate is the main entrance to the fort. The most beautiful palaces in the complex are the Chandra Mahal, Phool Mahal and Karan Mahal. The palaces, exquisitely built in red sandstone and marble are ornate with mirror work, carvings and paintings. An array of kiosks and balconies embellish the fort at intervals, breaking the monotony. A museum with valuable miniature paintings and rare antiques is also located in the Junagarh Fort. The magnificent fort in red sandstone, a fascinating juxtaposition of the Oriental style and European luxury that leaves you truly mesmerised. Designed by Sir Swinton Jacob for Maharaja Ganga Singh almost -90 years ago, this is an extraordinary monument. The palace has a billiards room, a library, a cards room and a smoking room. Belgian chandeliers, cut – glass ornaments, oil paintings and lamps, all adding to its charm. Beautiful 16th century Jain temples, dedicated to the 23rd Tirthankar Parshvanathji. Other important temples of Bikaner include the Lakshminathji, Ratan Bihariji, Shiv Bari, and Nagnechiji temple. The Bhaironji Temple at Kodamdesar, about 40 kms from Bikaner, is another noteworthy temple. Acquaint yourself with the indispensable ship of the desert at this camel research and breeding centre, the only one of its kind in Asia. This is a royal crematorium with cenotaphs of the house of Bikaji Rathore. Many decorated Chhatris, built in the memory of the Bika dynasty, offer splendid example of the Rajput architecture. Watch flocks of imperial sand grouse, as you wander through the lush foliage of woods located on the Jaisalmer road. Gajner is also home to nilgai, chinkara, wild boar and black buck. Gajner Palace, a summer resort of kings built on the beautiful lake along the sanctuary, is a spot worth visiting. Offer your prayers to Karni Mata – an incarnation of goddess Durga, at this 600 year old temple. The temple offers a haven to rats. Devotees feed the rats, owing to the belief that these rodents will be reincarnated as holy men. The entrance archway of the temple is intricately carved in marble. A sacred spot, dedicated to Kapil Muni. The temple here is the venue for a fair in the month of Kartik (Oct.- Nov.), attracting thousands of pilgrims. Kolayat is an idyllic picnic spot as well.Shiv Bari Temple - 6 km : Built in the 19th century by Maharaja Doongar Singhji, the temple is encircled by a high wall. Beautiful paintings and a Nandi Bull facing the Shiva Lingam are the attractions of the temple. An array of havelis - mansions of the merchants and lesser royals, built in red stone and intricately carved, embellish this beautiful city.Kalibanga - 205 km : The remnants of the pre-Harappan and Harappan settlements have been found at this place in Hanumangarh District. Surely of interest to archaeology enthusiasts. Jodhpur - 243 Kms is the nearest Airport while Jaipur - 321 Kms, the capital of Rajasthan is well connected to the metros cities of India such as Delhi, Mumbai, Kolkata and Chennai. Bikaner is connected by rail to cities like Delhi, Kolkata, Jaipur and Allahabad. Bikaner is connected by road with major cities in Rajasthan and North India. Delhi is 456 Km, Jaipur 334 Km and Jaisalmer 333 Km from Bikaner. After several battles with Marathas, Jai Singh was keen on the security aspect of the city. Due to this reason, he focused on his scientific and cultural interests to make a brilliant city. Being, a lover of mathematics and science, Jai Singh sought advice from Vidyadhar Bhattacharya, a Brahmin scholar of Bengal, to aid him design the city architecture. Vidyadhar referred the ancient Indian literature on astronomy, books of Ptolemy and Euclid, and discussed the plan with the King. The Pyramid shaped palace in pink sandstone is naturally airconditioned through the numerous perforated stone screens (jali) dotting its facade. The purpose of the palace was to provide the royal ladies from where they could watch royal processions in the bazaar below, hidden from the public eye. 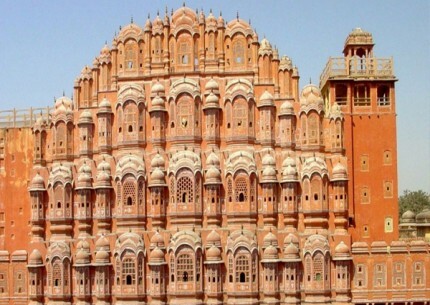 Centrally located in Jaipur, the city palace complex almost a seventh of the citie’s area. The principal enterance is the Sirh Deorhi Aatish gate being the auxillary one. This is the largest observatory among those built by the astronomer king Sawai Jai Singh II in various parts of the country. Also called as the "Yantralaya”. Its various instruments (yantras) were used to observe the movements of heavenly bodies as also to measure the local time and predict eclipses. Encircled by the pristine Maota lake & enveloped by lush green hillocks stands the majestic Amer Fort. 11 km from Jaipur, overlooking the Delhi-Jaipur highway, the fort used to be abode of the Kachchwala rulers, 7 centuries before Jaipur was built.It is approached by a step path which may be travarsed on elephant back. The main attraction inside the breathtaking Sheesh Mahal (palace of mirrors), a fascinating view of the Kesar Kyari in the Maota lake can be had from the ramparts of the fort. The Chattari is a complex dedicated to the memory of the queens of Jaipur. Also, enroute is Gaitore, where cenotaphs of the various rulers of Jaipur have been built. Intricately carved designs and elegant bas relief depicting the tastes of the person whom the cenotaph commemorates impart an aura of grandeur to the place.Jantar Mantar : Jantar Mantar is an ancient Observatory built between 1728 and 1734. Each instrument serves a particular function and give accurate readings. Located along the road of Agra 8 kms from Jaipur, this magnificient garden was built by Maharaja Sawai Singh II for his Sisodiya queen. It also has a palace flanked by galleries on three sides. The beautiful multilevel gardens are dotted by bubbling waterways, fountains, pools and enchanting pieces of scultpture. Originally built as a famine relief project the Bagh comprises a zoological garden, amuseum and numerous sportsgrounds. The landscaped zoo, apart from being the home of a large variety of flora and fauna is also the breeding ground of crocodiles and pythons. The Albert Hall museum inside the Bagh has a vast collection of brassware sculptures, paintings, crafts. Et al, reflecting the rich heritage of the city. The celebrated Persian carpet and Egyptian Mummy are principal attractionshere. 35 Kms. from Jaipur on NH 8, the sprawling artificial lake enveloped by emerald green hills is an excellent picnic spot. Boating and fishing are allowed and tourist accomodation is available at the Jheel Tourist Village.Galtaji : This ancient pilgrim centre lies amidst the low hills which flank the city. A small sun temple located at the highest peak provides a fascinating view of the city below. Numerous temples, pavillions and holy pools (kunds) occupy the sprawling green premises. The natural springs here are said to possess curative properties. The legend is that Galtaji was the place where the sage Galava performed penance 15 centuries ago. This serene palace of worship of Jains has graceful 19th century paintings lining its interior walls. It is situated on the Agra road. Located on a hill top, south of Jaipur Doongri, closely resembles a scottish castle. Near to Moti Doongri, is the Laxmi Narayan Temple dedicated to lord Vishnu. This white Marble wonder was built only recently. 11 Kms from Jaipur, this is on the Delhi road. This fort is a beautiful structure with some magnificient views. The lake below has facility for boating and the elephant rides should not be missed. The temple is still used as a place of worship by many locals on specific events. 15 kms on the western horizon from Jaipur lies theis medivial fort, gaurding the city. It has been preserved in good state with all its palaces, gardens and temples intact. One of the largest Cannos of the country "Jaiban” is also displayed here. Also called the tiger fort it is situated at a height of 600 feet, overlooking Jaigarh. Much of this guarding sentinels premises is in ruins except some new structures built in 19th centuary. The rooms here provide a spectacular bird’d eye view of the city. It is the haven of textile, the popularity of Bagru prints is world famous. A small hamlet about 35 kms from Jaipur, on the Ajmer Road has become a tourist destnation, after its fabric exports. The traditional Chipa printers continue their three centuries old tradition of hand block printing using natural dyes and treating the cotton cloth with eath and natural dyes. This world famous place is the abode of the country’s largest inland lake. It is 95 kms. from Jaipur. The grandeur of Rajputana haveli architechure is at its flambouyant best evident at Samode. Now converted to a Heritage Hotel, the grand Durbar Hall is its premier attraction. Nesteled amongst the wooded hills, it is an excellent spot for excursion. Sanganer is 16 kms from Jaipur on the Tonk Road and is very close to the Airport. It is famous for its craftsmanship as well as for its monuments. Sanganeri block print fabrics, hand made paper and blue pottery are appreciated worl over. 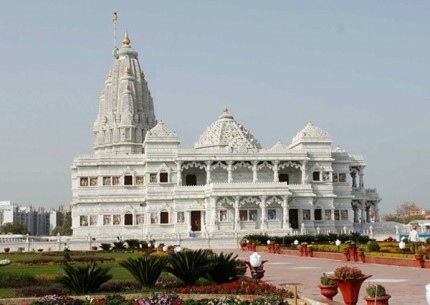 The Jain temples here showcase exquisite designs in white marble. Sanganer also, has some remenant ruiins of a fort palace. Indian Airlines connect Jaipur with Delhi, Jodhpur, Udaipur, Aurangabad, Bombay, Varanasi, Calcutta, Ahmedabad. Jaipur is connected by rail with Delhi, Agra, Ahmedabad, Ajmer, Abu Road (Mount Abu), Udaipur, Bombay and Sawai Madhopur. Jaisalmer was founded by Rao Jaisal in 1156 as a substitute for his more vulnerable capital at Lodurva, making it the oldest "living" fortified city in Rajasthan. For many, a visit here is the start of an enduring romance. Located in the heart of the Thar Desert on the far western border of India (55km/34 miles from Pakistan), it was strategically positioned on one of the central Asian trade routes, and fortunes were made by the Rajputs and Jain merchants who levied enormous taxes on caravans laden with silks, opium and spices, particularly during the 14th and 16th centuries. In the 18th century, some merchants, wanting to expand their homes, moved out of the fort to settle on the plateau below. Much as in the Shekhawati region, the wealth generated by their taxes was used to decorate the havelis of these wealthy Jain businessmen. Where frescoes satisfied the Shekhawats, here power was expressed by the construction of mansions whose soft sandstone facades were embellished with intricate, almost lacelike carvings. These oft-photographed sandstone mansions are indeed breathtakingly beautiful, but it is Sonar Killa, literally "Golden Fort," that makes it worth traveling this far west. It may not be as impressive or as clean as Jodhpur's Mehrangarh Fort, but its charm lies in the fact that this is the world's only inhabited medieval fort, its families living in homes they have colonized for more than 800 years. Unfortunately this charm is being eroded by the unchecked proliferation of hotels -- with close to 40 at the last count. Built entirely from yellow sandstone, the fort rises like a giant sand castle from its desert environs, with great views from the overhanging cannon ramparts; stare down on the city and desert vista, and you get a sense of how forts such as these once served the most basic of needs: protection against invaders from the plateau below. Sadly within you will find a place that has been commercialized -- its alleys lined with goods for sale and buzzing with traffic (tuk-tuks, hawkers, and tourists), excessive pollution (no bins or sewage infrastructure, and watch out for the cow dung), yet still with an awesome sense of timelessness (bar the motorcycles and persistent salesmanship). It takes no more than a few hours to tour the fort, including stops to visit the Jain and Hindu temples. And if you want to ride a camel into the sunset, Jaisalmer is one of the places to do it, as is Bikaner. So plan to spend 2 or more nights here, not least because it takes so long to get here (until the new airport is finished, that is) but also to acclimatize to the desert pace and climate, and seek out the essence of this border town. The history of Jaisalmer dates back to the medieval period when the golden city was founded by the Rajput chief Jaisala. The city was established in the year 1156 atop the Trikut hill by the Maharaja to prevent the possible encroachment of enemies. The initial capital of the Bhatti Rajput clan was at Lodhruva which lies at a distance of 15 kilometers to the south east of Jaisalmer. Legend has it that the city was established by Jaisala on the behest of the hermit, Eesaal. Jaisalmer grew in the medieval period and amassed great wealth from the caravans that traversed the region. The two routes that connected India to Persia, Africa, Egypt and the western countries facilitated trade in the region. The strategic location of the city prevented invasion from the foreign rulers. In the 13th and the 14th century the rulers of the city who were referred to as the Rawals, engulfed in a nine year war with the Turk Afghan ruler, Ala-ud-din Khilji. The Rajuts were defeated in the battle and had since then maintained a cordial relationship with the Delhi Sultanate. Sabala Simha was later awarded the royal patronage of the city by Shah Jahan after his chivalrous contribution in the Battle of Peshawar. Modern history of Jaisalmer includes its ties with the British Empire. The princely state joined the Union of India after the country gained independence. The hereditary bards, carans and the bhaals sing ballads of the chivalrous rulers of the city. Jaisalmer lost its economic importance after the establishment of the port city of Mumbai. After partition of the country, it also lost the trade routes that passed through Pakistan. It has now emerged as one of the important tourist destinations of the country. 40 km away,lying south-west of Jaisalmer, it is a protected bio- sphere reserve spreading over 3000 Sq. km. The awe-inspiring Sam sand dunes are within the park. This is also the bustard breeding location and wildlife where you can see the Indian Gazelle, Chinkara, Eagle and many such birds and animals. Foreign tourists require permission from the District Magistrate and Desert National Park Office to enter this area. Domestic tourists require permission from the Desert National Park Office.Loduva, 18 km away, has the ruins of the earlier capital and Jain temples, which are being, rebuild as reminders of its past splendour. From atop the Trikuta Hill, the Jaisalmer Fort casts its magical spell in the heart of every tourist. The fort was constructed by Rai Jaisala in the 12th century when he wanted a more secure place than Lodurva to serve as his capital. The fort is a symbol of an era gone by that is still alive in in its remnants. There is a group of five temples lying within the fort and built between the 12th and 15th centuries, these temples are an achitectural marvel. Visitors are allowed only till 12 O' clock in the afternoon. Elephants carved out of yellow sandstone guard this Haveli built by the Prime Minister of Jaisalmer in 1855. Two brothers, Hathu and Lallu constructed each side of the haveli. The whole mansion looks perfectly harmonious but you will notice that the right and left side of the building differs slightly in details. Gharisar had once supplied water to the city; a courtesan has built the temples and archways around it. The Havellis or mansions built by wealthy merchants and nobles are unmatched for the exquisitely carved sandstone facades. At one time, the city of Jaisalmer lay entirely within the Fort but during the 17th Century, Havellis were built below the Fort. The delicate pagoda like Tazia Tower rises from Badal Mahal (Cloud Palace). Rising in its five tiered splendour, with each storey graced by a delicately carved balcony, the tower is of historical significance. Muslim craftsmen built it in the shape of a Tazia and gifted to their royal patron. Tazias are ornately decorated bamboo, paper and tinsel replicas of a bier carried in procession during Mohurram. The most elaborate and magnificent of the Jaisalmer havelis. It has exquisitely carved pillars and extensive corridors and chambers. One of the apartments of this five story high Haveli is painted with beautiful murals. This 300 years old haveli of Jaisalmer's Prime Minister to Maharaja Rawal Gaj Singh - Salim Singh, has a beautiful blue cupola roof with superbly carved brackets in the form of peacocks. The extraordinary mansion in yellow stone is covered with intricate carvings and has an elaborate projecting balcony on the top storey. The mansion is one of the most notable of the array of havelies. Important thing to remember that All commercial flights to and from Jaisalmer have currently been discontinued. Jaisalmer has its own airport, 10km from the city proper with connections to Delhi and Mumbai; other important cities in India are connected via Jodhpur (275km). Jodhpur is also a convenient flight destination because the airport at Jaisalmer is very small & can accommodate only small aircrafts. Palace on Wheels - the king's train has Jaisalmer in its itinerary and that remains the best and most luxurious way of reaching Jaisalmer and explore it in opulence. There are direct trains from other cities of Rajasthan also which connects to Jaisalmer. Jaisalmer is connected to Jodhpur (275km), Bikaner (328km), Ajmer (500km), Udaipur (663km) and to Delhi (900km) by well-maintained state and national highways. Rental jeeps, buses and cars are available in these cities for those keen on travelling by road. The Rathores enjoyed good relations with all the Mughals, except Aurangzeb. Maharaja Jaswant Singh even supported Shahjahan in his struggle for succession. After Aurangzeb's death, Maharaja Ajit Singh drove out Mughals from Ajmer and added it to Marwar (now Jodhpur). Under the reign of Maharaja Umed Singh,Jodhpur grew into a fine modern city. One of the most stunning hill forts of Rajasthan, Mehrangarh appears to rise from the bluff-coloured sandstone hill itself, so well built into the base that it is difficult to tell where the hill ends and the walls begin. Founded in the 15th century by the Rathore Rajputs when they shifted their capital form nearby Mandore to Jodhpur (or the region known as Marwar), it is approached by a series of seven gateways set at an angle so that armies could not charge them with any success. Pass the gates, the fort-palace take one's breath away. Across form huge courtyards are set wings of palatial apartments that have been built over five centuries of bristling history. Today, managed as a museum by the royal trust that maintains it, only some of the more spectacular palaces of Mehrangarh are open to visitors. These consists of Moti Mahal with its pierced screen windows overlooking the coronation seat where the Rathore rulers have been ritually appointed to rule, Jhanki Mahal, the Apartment from where the zenana women would watch ceremonial events; Chandan Mahal, where affairs of state were discussed; the royal Darbar Takhat or throne room with its octagonal throne; and the Rang Mahal where the Maharaja would play Holi with his zenana. Also noteworthy are Sheesh Mahal, Phool Mahal, Umaid Vials and Maan Vilas, while a large ten seized from the Mughals in battle is spread for viewing in what has come to be referred to as the Ten Room. Mehrangarh from the outside is impressive, and certainly forbidding. There is a surprising lightness to it though, once actually within the fort. The builders seemed to want to make up for the stern austerity of its wall with an overwhelming profusion of windows and jharokas at the upper ends. The effect seems to exaggerate its already impressive height. Umaid Bhawan Palace can qualify for several firsts the largest private residence in the world, the finest extant example of art-deco, the only palace to have painting from the Ramayana painted by a Polish artist, the first to use air-conditioning, electricity and elevators, and the most impressive for its size and dimensions. Yet, that should be hardly strange, for the architect, H.V. Lancaster, who planned it, wanted it to rival the Vice Regal Lodge (now Rashtrapati Bhawan) then being planned by Sir Edward Lutyens in the new capital at New Delhi, also then under construction. For starters, Umaid Bhawan is a formal building that is perfectly symmetrical, and its 347 rooms offer few concessions to Rajput architecture other than such devises as concealed corridors and balconies for the women of the zenana, and the use of courtyards around which the several wings of the palace are arranged. Built at the height of the art-deco period, there are several embellishments o n the outer walls, such as the eagle, carved from sandstone. All original fittings have been retained. While many of its accoutrements are in use, others have been placed in a museum within the premises. Here, you can find out for yourself the fine chine used by the royal family, trace the history of the clocks and telephones that were once put to use in the different rooms, and discover a bit of your own past in a nostalgia-driven journey through a time not so long ago. A cluster of royal cenotaphs in white marble built in 1899 A.D. in memory of Maharaja Jaswant Singh II. Within the main cenotaph are the portraits of various Jodhpur rulers. Located in the Umaid gardens on High Court Road, it has a large and fairly interesting collection. There are many stuffed animals, including a number of desert birds in two glass cases, each with a thorn bush. The military section includes cumbersome wooden biplane models and an extraordinary battleship. This is an excellent museum with rare and interesting artifacts, textiles, paintings, transport items etc. laid out with utmost care and thought. The Palanquin Gallery and Howdah Gallery display a superb collection of old and costly specimens of great historical value. Recently the ruling family of Jodhpur has converted a part of the gigantic Umaid Bhawan Palace as a Palace Museum. The items on display include rare collection of clocks and watches, fine chine, ornate mirrored furniture, glass and crystal ware, photographs etc. The visitors get access to the grounds and parts of the Umaid Bhawan Palace, one of the largest private residences in the world. About 8 kms form Jodhpur; Mandore was the capital of Marwar. This enchanting place having beautifully carved cenotaphs, halls of heroes, palaces and old fort, is of immense historical importance. The Janana Mahal, which was built for the use of royal ladies by Maharaja Ajit Singh (1671- 1724 AD) in Mandore Garden, has been developed as a museum. The Natural History section has an African Bison and a crocodile of 11 feet. The long Art Gallery exhibits large paintings of Maharajas of Jodhpur and events in their lives. There is a complete section of miniature painting on Raga-Raganis. The museum also has sculptures of gods and goddess, mentionable among them being the stature of Dancer (12th century AD) and carving of Krishnaleela on one big stone found from Kiradu. The carving in Devals, Dalan, Chattris and Ek Thamba tower make the Mandore museum and example of excellent architecture. One of the best places to visit in Jodhpur. Serves as an Picnic spot. This artificial lake was built during 1159 AD and is located 7 km from the Jodhpur. One of the most scenic places in Jodhpur, the Balsammand Lake is surrounded by lush green gardens and cascading waterfalls. On the banks of this lake is the famous Balsammand Palace, a must see point in Jodhpur. One can get sight of beautiful peacocks, jackals all over the lush greenery. Mandore is an ancient town located around 9 km from Jodhpur. This town boasts of its several historical monuments, few including ruins of the past including the ruined Mandore Fort. This place is worth visiting as it revives the ancient history and highlights the royal past of India. Other than the monuments, one can also visit the Mandore Gardens which forms one of the main attraction among tourists. This garden is actually a charming collection of temples and memorials including the Government Museum (worth seeing). The museum houses the Hall of Heroes which houses popular heroes of the area. Kaylana Lake is an artificial lake built during 1872 by Maharana Pratap Singh towards the west side of Jodhpur. One of the most popular landmarks of Rajasthan, the Jaswant Thada is a white marble memorial built by Sardar Singh in the memory of Maharaja Jaswant Singh II in 1889. This monument is a finest example of excellent marble works with sheets of marble intricately carved to form an rare artifact. This ancient cremation ground for the rulers of Jodhpur is exquisitely built and is beautifully landscaped. Jodhpur around 8 km from the main city. This sanctuary is located 40 km from Jodhpur and serves as a great tourists destination. This sanctuary houses large population of black bucks, desert foxes, nilgais and partridges. Visit this place early morning for great animal spotting. Serves as a great one day tour. The Jodhpur Airport is 5 km from the city center. Regular flight services connect the city with other major cities in and around Rajasthan. There are daily flights to Delhi, Mumbai, Udaipur and Jaipur. Jodhpur is well connected by railway lines. Trains to Delhi, Mumbai, Chennai and Kolkata are easily available. The "Palace on Wheels” also visits this city of royal splendor. Mount Abu has been home to many sages and saints. Most famous of them was Sage Vashishtha who is believed to have created four agnikula Rajput clans from a fire-pit by performing a yagna or fire sacrifice, to protect the earth from the demons. The Yagna was performed besides a natural spring situated below Abu, emerging from a rock shaped like a cows head and hence the site was called Gaumukh. A natural spring flowing through a sculpted cows head gives the shrine its name. The famous yagna of sage Vashishtha was performed here. A beautifully sculpted hill temple of Arbuada-the mighty serpent stands against the beautiful backdrop. Nearby is the magnificent marble image of Nandi, the celestial bull rescued by Arbuada. These beautifully carved temples built between 11th and 13th century A.D. are sheer elegance in marble, dedicated to the jain Tirthankaras. The Vimal Vasahi temple is the oldest of these dedicated to the first Tirthankara. Built in 1031 A.D. (by Vimal Shah-a merchant and representative of then Gujarat ruler), it is a superb example of temple architecture. The temple is chiselled out of a huge rock reached by a flight of 360 stairs. A favourite tourist spot. Spectacular sight of the setting sun when the hills are covered in the golden glow can be viewed from here. Also known as Andra Point, it offers an enchanting view of the verdant plains and valleys. The place looks most beautiful during the dusk hours. Beautifully laid parks and gardens are interspersed throughout the hilly paradise. Ashok Vatika,Gandhi park, Municipal Park,Shaitan Singh Park and Terrace Garden are some of the noteworthy gardens. Located at the Raj Bhawan, it was a collection of archaeological excavations dating back to 8th-12th century A.D. It also has Jain bronze carvings,brassworks etc. for viewing. Named after the British engineer who constructed it, Trevors Tank is a delight for birdwatchers with densely wooded hills that are a haven to pigeons, peacocks and partridges. An impressive fort with some beautiful jain temples enclosed within. Among the noteworthy temples are Achaleswar Mahadev Temple (1412 A.D.) and Kantinath Jain Temple (1513 A.D.) . The latter has gold plated image. Mandakini Kund and a sculpture of Parmar Dharavarsh are situated close to the Achaleswar Mahadev Temple. The Fort was built in the 14th century A.D. by Rana Kumbha and is approachable by a motorable road. The highest peak on the mount (1722 mts. Above the sea level) allows a birds eye view of the sylvan surroundings of Mt. Abu. A small Shaivite shrine and a temple of Dattatreya standing on the shikhar are worth a visit. The nearest airport to Mount Abu is Dabok Airport in Udaipur. Mt. Abu is 29 km from the nearest railway station situated at Abu Road on Delhi-Mumbai route. Taxis, jeeps and buses are available from Abu Road to Mount Abu. Mt. Abu is well linked with smooth roads to all the major cities in northern and western India including Ahmedabad, Jodhpur, Udaipur and Jaipur. If Rajasthan is synonymous with forts and palaces, it is also synonymous with fairs and festivals. Few things can match the effervescence, vigor and brightness of traditional fair like the world famous Pushkar. The picturesque lake of Pushkar is surrounded by hills on three sides and sand dunes on the fourth-a perfect site for the annual religious and cattle fair, held in the month of October-November. Pushkar is a sacred place for Hindus and has a staggering 400 temples, of which the most important is dedicated to Lord Brahma. According to legend, for five days in a year, all the gods visit Pushkar and bless the devout-hence the unbelievable number of devotees who flock to the lake to wash away their sins. These five crucial days also coincide with the biggest cattle fair of the country. Virtual armies of camels, cleaned, washed, and adorned, descend on Pushkar and villagers do brisk business. A visit to Pushkar fair is truly the experience of a lifetime. There are many legends associated to the birth of Pushkar and Pushkar Fair. One thing is clear that most of them are associated with Lord Brahma. It is said that in a battle, Lord Brahma killed the demon Vajra Nabh with a lotus flower, whose petals floated down to earth and landed in three places in and around Pushkar where lakes sprang up. According to another legend, back in a legendary time, Lord Brahma was flying over the Rajasthan desert on his swan, when some petals fell from his hand and drifted down. Miraculously, blue lakes sprang up where the flowers had touched the soft sands. Just then, Lord Brahma realized that this was the auspicious moment to perform a fire sacrifice or yagna. His wife Savitri was not with him at that time and the yagna would be incomplete without her. So Brahma married a local girl and sat down for the without her. Meanwhile Savitri landed on earth and upon finding this new bride sitting next to Brahma, she was raged with fury and cursed him that he would never be worshipped anywhere else on earth. Ever since then, when the full moon shines on Purnima during the autumn period of kartik, the desert tribes meet to commemorate this epic event. It is interesting to note that Brahma is not worshipped, even though he is one of the Holy Trinity of Hinduism. 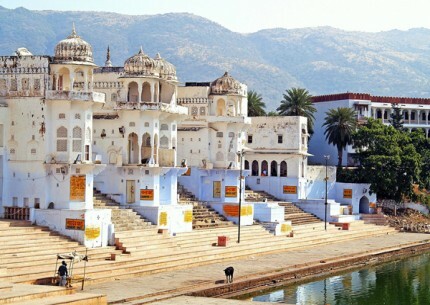 This is the only temple in the world where Lord Brahma is worshiped and the main attraction of Pushkar. The temple has a special position in Hindu pantheons. There is life-size four-armed idol of Lord Brahma - the creator in the vestibule. The temple has marble floors and stairs and coins have been put by the devotees to mark the birth or deaths of the loved ones. Pushkar Lake is another important attraction of Pushkar and it has immense significance for the followers of Hinduism. According to the legends, the lake was dedicated to Lord Brahma after a lotus fell from his hands and dropped into this picturesque valley. A lake sprang up on the same spot latter on which is considered holy. The entire lake is supposed to be surrounded by 500 temples, 52 palaces, and 52 ghats. On the occasion of Kartik Purnima in November every year, devotees take holy bath in the lake and a fair is organized, known world over as the Pushkar Fair. The temple is dedicated to Savitri, the wife of Lord Brahma and located on the top of the Ratnagiri Hill. According to the legends when Lord Brahma performed a Yagna (holy fire devoted to gods) along with Gayatri, a local milkmaid, furious Savitri cursed her husband that he would never be worshipped anywhere except in Pushkar and that too only once a year. Savitri left for the Ratnagiri Hill after cursing her husband and immolated herself there. There is beautiful statue of Goddess Savitri inside the temple. Other important temples in Pushkar are 19th century Mahadeva Temple is dedicated to Lord Shiva - The Destroyer, with five faces. It is known for the elegance of its structure and ornamentation. Rangaji Temple is dedicated to Lord Vishnu - the preserver and built in the South Indian architectural style. There are two massive dwarpals (gatekeepers) structure in front of the main gate and an image of Garuda inside. Another important temple is of Varaha - an incarnation of Lord Vishnu and built in 12th century. A bustling bazaar, the Pushkar local market offers tourist as well pilgrimage related products. A range of souvenirs could be purchased including the Rajasthani costumes, jewellery, embroidered fabrics, decorative pieces and groovy accessories. The bazaar becomes a hub of activity during the annual Pushkar Fair. The most important reason of Pushkar being on the international travel map is Pushkar Fair. The fair is held every year in the month of November during the Kartik Purnima (day of full moon) when hundreds of thousands of people take a holy dip in the sacred Pushkar Lake. This is also an occasion to organize the largest camel fair in the world. Kuchaman, Kishangarh, and Roopangarh are some of the better-known excursions from Pushkar. Ajmer is one of the major cities of Rajasthan and famous for annual urs celebrated here. Ajmer is a major city in the North Rajasthan and located just 14 km from Pushkar. The most popular attraction in the city is the Dargah or tomb of the 13th century Sufi Saint Hazrat Khwaja Moinuddin Hasan Chisti. Other attractions are the Anna Sagar Lake, the Nasiyan Temple, and the Arhai Din ka Jhonpra. Sambhar Lake is a declared wetland of international importance and a wonderful place for excursion. It is a place where horizons stretch to infinity and water and sky merge in a shimmer of gauzy blue. The lake is considered as the bird watchers paradise and home to around 140 species of avifauna. Jaipur is the nearest airport at a distance of 145 km. There are regular flights to Delhi, Mumbai, Udaipur, Jodhpur, Ahmedabad, and Aurangabad from this airport. Nearest railway station is Ajmer with direct trains for Jaipur, Delhi, Jodhpur, Udaipur, Mumbai, Ahmedabad, and other major destinations in the region. There are faster trains like Shatabdi Express who connect the Ajmer with Delhi. Pushkar is connected to Ajmer by road, which is around 14 km away. Buses in most cases leave Ajmer in the morning from Daulatabad Bus Stand. Jeeps and taxis are also available but on a fairly higher cost. Distances from Pushkar to the major cities in Rajasthan and India are Delhi 403 km, Jaipur 145 km, Udaipur 289 km, Mumbai 285, Agra 377, Jodhpur 214, and Chennai 1992. Ranthambore is also categorised as a heritage site because of the picturesque ruins of the fort that dot the park. The lake palaces, 'chhatris', old fortifications and a majestic fort dating back to 1,000 years overlook the park. The Jogi Mahal and the Padam Talao are the unique features of Ranthambore National Park. The park is famous for the majestic Royal Bengal Tigers, which can be seen around the lakes and watering holes, prowling through the forest or resting on the ruins of the fort. Ranthambore National Park is one of the best sanctuaries to see tigers in their wild habitat in India. 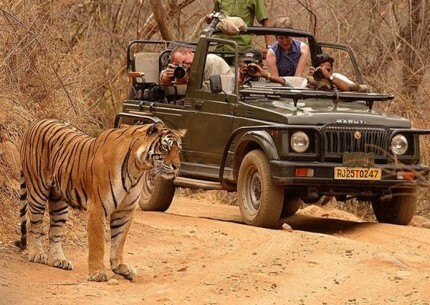 Many dignitaries have visited Ranthambore National Park to see its majestic tigers. President Bill Clinton of the United States came to Ranthambore National Park on his visit to India and expressed his delight at seeing the tigers of Ranthambore. The area of Ranthambore is wealthy in history. The Ranthambore national park was under the power of the Rajput emperor Hamir but was beaten by Alaud-din-Khilji's military in AD 1301. And in the end, Ranthambore was affirmed a wildlife sanctuary in 1955 and turned in to the part of Project Tiger in 1973. The Fort, nearly one thousand years old and several kilometers in circumference, is open from dawn to dusk. It is a very special place for bird watching and occasionally leopards use the area. Dramatic views of the lakes and the forest below give an idea of the scale of the Park. Occasionally tigers can also be seen from the top of the fort. You can always visit it between park drives. Walking in the National Park is prohibited and only place you can walk around is the Ranthambhore Fort. It is a 20 minutes walk up to it and the area around the Ganesha Temple is dotted with old water tanks, Chhatris, Palaces, and mosques. Jogi Mahal is a forest rest house, some 250 years old, and commands the view of Padam Talao or the lotus lake on one side and the ramparts of Ranthambhore Fort on the other. Adjacent to it is one of India's largest banyan trees, fondly known as the 'walking tree' because over the years it has sent out so many branches thereby increasing its shade are. This rest house was closed to the public in 1992. To visit it requires special permission of the Deputy Field Director, Core Area. Mansarovar and several other water bodies in and outside the park attract thousands of migratory birds during winter and also especially exciting for bird-watchers. Sometimes in these area you can even find a herd of black buck, the rarely seen antelope of this and region. People worship this antelope as Krishnamrig or Lord Krishna. Even though it lives around villages and often devastates fields it is held sacred and never attacked. An evergreen are of Jamun Groves, lots of running streams, it is a favourite place for tigers to cool off at the height of summer. This is an excellent place to watch sambar deer, especially when they are in rut, bet November & February. The sambar in Ranthambhore is a favourite prey of the tiger, and Bakaula is famous for endless tiger kills. A valley of Flame of the Forest trees that turn deep red towards the end of March. Around the Kachida waterhole you can find concentrations of spotted deer whose rutting seasons lasts throughout the year. It is also well known for its two resident leopards that frequent this area. This is rather special as leopards are very difficult to sight in tiger country. Twice a year in October & May the Rajbagh Lake is carpeted with lotus flowers and is filled with lotus-eaters. It has the highest density of sambar deer and marsh crocodile. This lake has a series of backwater pools that are used in the monsoon by crocodiles who lay their eggs in large holes in the banks. Scores of young crocodiles can be seen in these pools in October and November. Rajbagh is also frequented by birds of prey like the crested serpent eagle, the grey-headed fish eagle, the osprey, the crested hawk eagle and the brown fish owl. The back pools are like little nurseries for chital and sambar whose young ones can be found here in large numbers with their mothers. The most dramatic cliffs of Ranthambhore are found here. Some call it the Colarado of the area. Hundreds of vultures can be found nesting in these high cliffs. A few kilometers away is Guda where you can see good populations of the Nilgai or the bluebull. Their courtship takes place between November and February and you can watch the clash of two big males as they fight for attentions of the female. This point gives you a virtual 'aerial' view of the Park and is well worth the time it takes getting there. You can see the dramatic hill ranges of the Aravalllis & the Vindhyas from here. On this drive you might also see the Indian gazelle or Chinkara, which is quite rare in Ranthambhore. These deer are very shy and are normally found in twos and threes. They are the most elegant and dainty antelopes to be found in this area. The road branches after Lakarda and if you take the road to the right, within a kilometer, you will come across breathtaking landscapes that seem to stretch till infinity. When you reach a T-junction you have the Berda Valley on your right and the Semli Valley on your left. And both are spectacular! Both these valleys have been used frequently in the past by tigresses raising their litters. The terrain has numerous nallahs or dried streambeds, and excellent protective cover for young tigers to shelter in. The grass around attracts good populations of deer and is vital in providing food to the young tigers. The road to Khemsa Kund circles the side of the Fort that was always attacked over the last thousand years. Khemsa Kund itself is an ancient water tank and well worth seeing. According to tradition there was an underground tunnel that led from the Forts residents used this in times of drought for the Kund always had water. After you pass Rajbagh Lake you start climbing and cross Ghazal Hill till you reach the peak of Kukraj. From here you get an unbelievable view of the National Park. This drive through the plateaus of Ranthambhore is very good for bear sighting and they are be found rummaging around termite hills. It is in this area that some of the encounters between tigers and bear have been witnessed. A large flat grassland, surrounded by sharp ridges, makes this a relatively undisturbed area and very good for viewing deer, antelope and tigers. There is a small lake that has water till March and attracts a large amount of birds including the pelican. This valley also has good sightings of lesser cats like the jungle cat and the caracal. This is lovely road full of .Tendu tree and is one of the most scenic drives in the park. The road curls around to Guda and comes back via Phutakot. In the fruiting season of the Tendu in March, the sloth bears of Ranthambhore feast along this road.It is a route where wildlife viewing is limited, but the diverse landscapes make up for it. The "City of Sunrise," often described as the most romantic city in India, was built around four man-made lakes, the placid blue waters reflecting ethereal white palaces and temples, beyond which shimmer the distant Aravalli Hills, apparently the oldest range in the world, predating even the Himalayas. Udaipur has a real sense of space and peace, and the city is mercifully free of the kind of intense hucksterism that so marks the Indian street experience. This may have something to do with its proud Hindu history, for the city is not only known for its gracious palaces, temperate climate, and beautiful views, but for maintaining a fierce independence from even the most powerful outside influences. It fought bloody wars to repel Turkish, Afghan, Tartar, and Mongol invaders and rejected allegiances with the Mughals, only to acquiesce in 1818, when the state grudgingly came under British political control. Capital of the legendary Sisodias of Mewar, believed to be direct descendants of the Sun (an insignia you'll see everywhere), Udaipur was built on the shores of Lake Pichola by Udai Singh II in 1559, who returned here after the third and final sacking of the previous Mewar stronghold, Chittaurgarh. Udai Singh's son, Pratap, kept the Mughal invaders at bay for a further 25 years and is said to have been so disgusted by Man Singh and the Jaipur raja's obsequious relations with the Mughals that, after one historic meeting, he had the ground where Man Singh had walked washed with Ganges water in order to purify it. Maharana Fateh Singh was also the only Rajput prince who refused to attend the Delhi Durbar held for King George V in 1911, despite the fact that the British had acknowledged him as the head of the princely states of Rajputana. Much of Udaipur, particularly the old part located on the shores of Lake Pichola, is where you'll find the city's most striking landmarks -- the towering City Palace and Lake Palace - and it still feels remarkably like a 16th-century Rajput stronghold, with the benevolent Maharana still treated like a reigning king by his devoted and loyal subjects. You can witness this firsthand by attending the temple at nearby Eklingji on a Monday evening, when the Maharana -- the 76th ruler of one of the world's oldest surviving dynasties -- often joins his subjects to pay his respects to Shiva. Try to spend at least 3 to 4 days in Udaipur, whether you spend them aimlessly wandering its mazelike lanes, taking a slow cruise on Pichola Lake, exploring the giant medieval fortress and palaces that rise from its shores, or setting off to see the intricately carved Jain temples of Ranakpur and the ancient fort of Kumbhalgarh -- or whether you do nothing but loll on a comfortable divan from a hanging Jarokha overlooking the lake. You'll find the City of Sunrise the most relaxing part of your sojourn in Rajasthan, in fact so much so that many end their Indian sojourn with a few days reflecting in its tranquil waters. Maharana Udai Singh II founded Udaipur in 1568 after his citadel Chittorgarh was sacked by Mughal Emperor Akbar. The legends says that Udai Singh was guided by a holy man meditating on the hill near Pichola Lake to establish his capital on this very spot. Surrounded by Aravali Ranges, forests and lakes this place was less vulnerable than Chittorgarh. Maharana Udai Singh died in 1572 and was succeeded by Maharana Pratap who valiantly defended Udaipur from subsequent Mughal attacks. Maharana Pratap is the most revered Rajput icon and gallantly fought the Mughal at the Haldighati in 1576. Mewar continuously defied foreign invaders and has a history of bloody battles until the British intervention in the nineteenth when a treaty was signed to protect Udaipur. Upon independence Udaipur merged in the union of India. Standing on the east bank of lake Pichola, is a massive series of palaces built at different times from 1559 A.D. The balconies of the palace provide panoramic views of "Jag Niwas" (the world wide famous Lake palace hotel), Jag Mandir on one side and on the other the city of Udaipur. Its main entrance is through the triple-arched gate - the Tripolia, built in 1725. The way now leads to a series of courtyards, overlapping parations, terraces, corridors and gardens - a harmonic profusion hard to describe. There is a Suraj Gokhda, where the maharanas of Mewar presented themselves in the times of trouble to the people to restore confidence. The Mor-chowk (Peacock courtyard), gets its name from the vivid mosaics in glass decorating its walls. The chini chitrashala is noteworthy while a series of wall paintings of Krishna are on display in Bhim Vilas. There are numerous other palaces such as Dilkhush mahal, Sheesh mahal, Moti mahal and Krishna vilas - in memory of a princess of striking beauty who poisoned herself to avert a bloody battle for her hand by rival princess. Now the palace contains many antique articles, paintings, decorative furniture and utensils and attracts thousands of visitors every day. Originally known as the Jag Niwas, took three years to build and was inaugurated in 1746. Nothing but marble is used in the composition of this palace. It is now a luxury hotel. Another island in the Lake Pichola, which is known for its beautiful garden courtyard. Shah Jahan took refuge here while revolting against his father. Pratap Museum, While entering the City palace the straight way go to the Government Pratap Museum housed with old sculptures and inscriptions. The antique paintings of Mewar, the turban of prince Khurram later on called Shah Jahan,who built world famous Taj Mahal has also been displayed here as a token of friendship of Maharana Khazan Singh. Next to Fateh Prakash Palace, houses beautiful glass and mirror works. An excellent museum of folk arts. Also hosts great puppet shows in its auditorium. A top the Moti Magri or Pearl Hill, overlooking the Fateh Sagar Lake is the memorial of the Rajput hero Maharana Pratap with a bronze statue of the Maharana astride his favourite horse "Chetak". More details are available at Maharanapratap.net, a fantastic colloction of facts and figures on Maharana Pratap and his life. The summer resort of the Maharajas is atop the hill overlooking all the lakes. This palace had an ingenious way to collect rain water for consumption all year around. A Temple situated in the middle of the city - a big tourist attraction, The temple of Jagannath Rai, now called Jagdish-ji, is a major monument and should be seen carefully. Raised on a tall terrace and completed in 1651, it is a tribute alike to the tenacity of its builders and the resilence of the art tradition it represents. It attaches a double storeyed Mandapa (hall) to a double - storied, saandhara (that having a covered ambulatory) sanctum. The mandapa has another storey tucked within its pyramidal samavarna (bell - roof) while the hollow clustered spire over the sanctum contains two more, non - functional stories. Lanes taking off from many of the sheharpanah (city wall) converge on the Jagdish Temple and walking leisurely through them brings you face with the many layers of the cultural palimpsest that Udaipur is. It was built by Maharana Jagat Singh Ist in 1651 A.D. It is a good example of Indo - Aryan architecture. Fateh Sager Lake is one of the most romantic vicinity for young lovers, it is situated in the north of Lake Picholas. It is the most peaceful and relaxing place to spend leisures for much of the travellers and Udaipur localities . This beautiful Fateh Sager Lake bestow with infinite beauty of the Aravali hills at the backdrop of serene lake body. It was originally build by Maharana Jai Singh in the year 1678 AD, but later on reconstructed and extended by Maharana Fateh Singh, As lot of destruction was caused, due to the heavy rains. Whereas, today Fateh Sager Lake is the most preferable site for endless wanderers, the mornings and evenings are very much refreshing around the lake, and in the middle of lake, you can see a grand Nehru park, which is a popular garden island, showcase an image of boat shaped cafe. The lake is one of the major attractions of Udaipur, these are some real moments that you will going to witness, once please your eyes with the precious sapphire of Udaipur. Lake Pichola is one of the most fascinating lakes, which has two islands, Jag Niwas and the Jag Mandir. This beautiful shimmering lake is 4km long and 3 km wide, originally built by Maharana Udai Singh II after he discovered the jewel of Rajasthan "Udaipur”. There are many ghats, like the bathing and washing ghats, which can be approached through boats from the City Palace of Udaipur (Bansi Ghat). In the heart of lake, most delicate world marvel is built the Lake Palace which is now converted into a heritage palace hotel. This captivating palace hotel is considered to be 3 decades old in the history of Udaipur. The Lake remains fairly shallow, at the time of heavy rains, and gets dry easily at the time of severe drought. Once the island dries, it makes the best time to take the leisure walk inside the most remote parts of Lake Pichola, where one can sight row of crocodiles, which is none other a thrilling experience for most of the enthusiastic travellers. "Do you know, Udaipur is a blessed soil of hermit, who advised Maharana to establish his kingdom over Lake Pichola, after the fall of Chittaurgarh by Mughal emperor Akbar." Asia's only one solar observatory, The Udaipur Solar Observatory is situated on an island in the middle of the Lake Fatehsagar (Location: 240 35.1' : 730 42.8' ) and the main office building is located at its NW-shore near Bari Road - Rani Road Junction. The site is run under PRL (Physical Reaserch Lab) in Ahemdabad. The sky conditions at Udaipur are quite favourable for solar observations. The large water body surrounding the telescopes decreases the amount of heating of the surface layers. This decreases the turbulence in the air mass and thereby improves the image quality and seeing. The main objective of obtaining the high spatial and temporal resolution observations of solar photospheric and chromospheric activity is to understand the various dynamic phenomena occurring on the surface of the Sun.USO(UDAIPUR SOLAR OBSERVATORY) is one of The six sites comprising the Global Oscillations Network Group Network in World. Debock Airport is 24 km from the city centre, Dairy Indian Airliness flights connect Udaipur with Jodhpur Jaipur aurangbad, Mumbai and Delhi. A wide network of bus service link Udaipur with several destinations. Some of the important distance are Agra 630km, Ahmedabad 262 km Jaipur 406 km .Jodhpur 275km and Mount Abu 185 km.